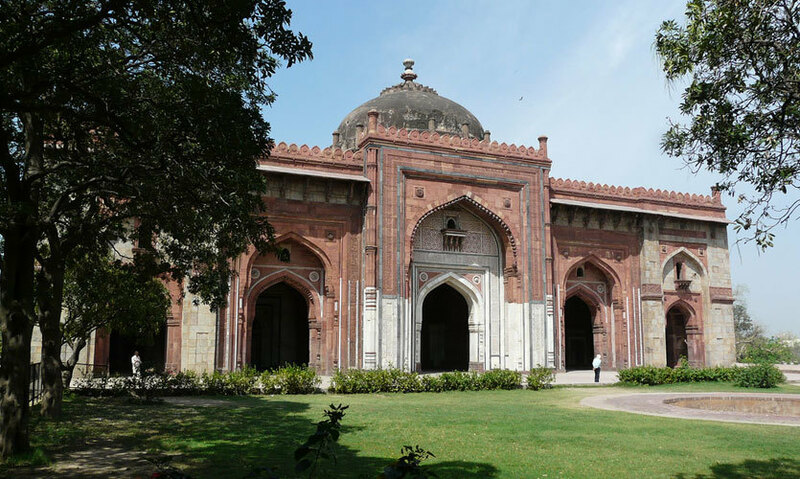 Built by Sher Shah Suri in 1541 as a congregational mosque, “Qila-Kuhna” or “Qal’a-i-Kuhna” roughly translates into “Mosque of the Old Fort”. 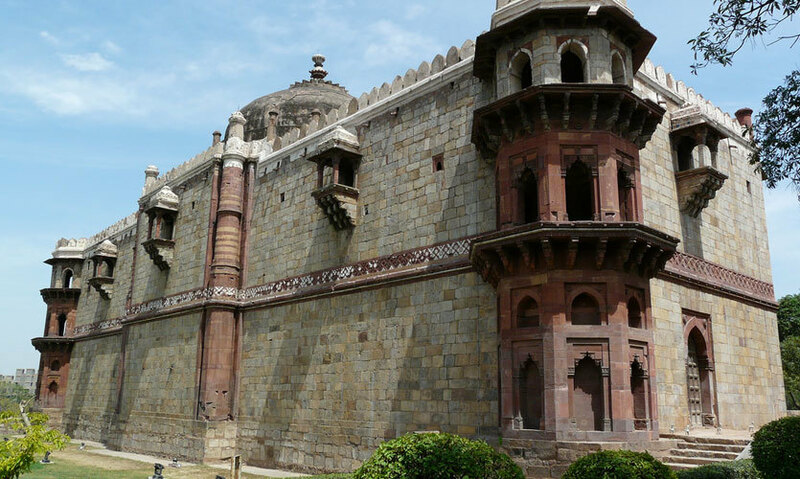 This handsome structure, along with Sher Mandal, are the only two surviving structures of Delhi’s Purana Qila, which was conceptualized and started by Sher Shah but took final shape only under the scalpel of Humayun. Qila-i-Kuhna is not open for prayers these days. It stands on a ground of well-kept grass and springs to your sight soon after you enter through the main entranceway. Though built as a Jami Masjid for the Sultan and his courtiers, it is shorn of any ascetic aspect, but is as imposing and laden with exquisite decorations as any other ornate piece of architecture of the pre-Mughal period. Right in front of it, in the small enclosed lawn upon which it stands, is also the dried up tank that served as the Wazoo Khaana- the water tank used for performing ablutions before and after prayers. Its octagonal turrets are visible first, when you approach it from behind. There is something earthy about the design that appeals to you. It is not as carefully crafted and chiselled as the Taj Mahal but there is the sense of sharp cuts and blind edges that takes away the aspect of the serene but makes the structure simply beautifully, symmetrically rugged and awe-inspiring. The mosque is a mixture of white marble and red sandstone, juxtaposed and contrasted in unconventional but striking symmetry. The design and other architectural features of the masjid are brilliantly intricate and beg minute attention. You actually find yourself bending down and often sitting cross-legged to admire the stone pastiche and inlay in dark bold colours and sharp stone cutting. 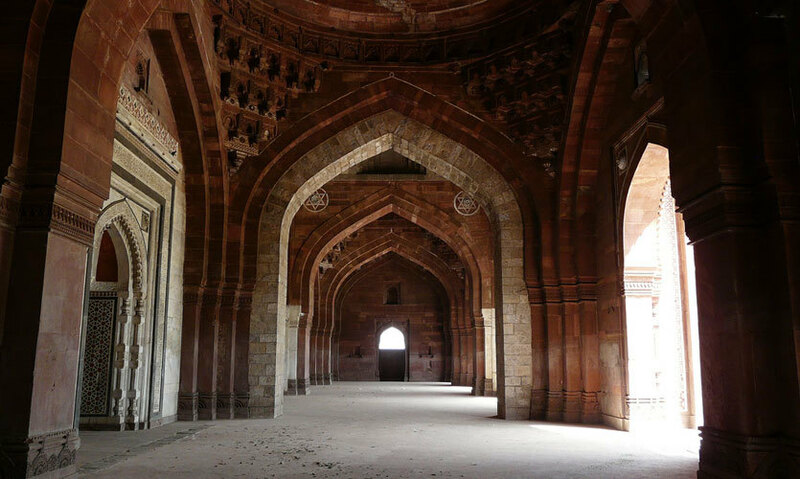 The prayer hall had five magnificent openings with horse-shaped arches. The central arch, higher than the others, is framed within a projection and flanked by pilasters. The recessed surface of the arched doorways is beautifully decorated with stone inlay. At the apex of each arch, is a small aerial window. The mihrabs inside are decorated with utmost care, with concentric arches. There are staircases leading to a narrow gallery on the second storey from both ends of the hall. The rear corners also rise with double-storeyed towers and aerial windows. The central bay of the hall is also bestowed with a single dome, with what looks like chhatris on either side. There is also the typical radical fusion of imagery that can be seen in the kalash engravings in the inner mihrabs and lotuses in various postures of blooming and blossoming. Being a mosque, there are exquisitely carved verses of the Holy Quran stuccoed on the walls and the mihrabs so that the worshippers can look, read and recite. The familiar script of “subhanallah”, “husnuma-allah” and “bismillah” from the Salaam are clearly discernible even to a non-Muslim, such is the clarity of the stone engraving notwithstanding its delicate intricacy and sheer thinness of font. This place of worship appears rather unusual to unaccustomed eyes, with its intentional, well-turned out jaggedness and distinct lack of circularity. But when you notice the mosque’s walls smeared with commonplace names of commonplace lovers, swearing eternal love through the debasement of an ancient relic, a gush of uneasy familiarity takes hold of you. And when you see a bantering group of twenty boys rush into the premise, ignoring the loud determined calls of the guards to keep all footwear out of the place of worship, you really wonder if anything is all that different to the modern-day visitor!